MANILA, Philippines – Filipino beauty queen, Miss Tourism International 2012 Rizzini Alexis Gomez, has died after a battle with lung cancer. She was 25 years old. Rizzini's father, former PBA player Rhoel Gomez, confirmed the news to ABS-CBN. She died in the morning of Tuesday, October 13, at Cebu Doctors' University Hospital in Cebu City. Rizzini won the Mutya ng Pilipinas Tourism title in 2012 and continued on to win the Miss Tourism International pageant later that year in Malaysia. 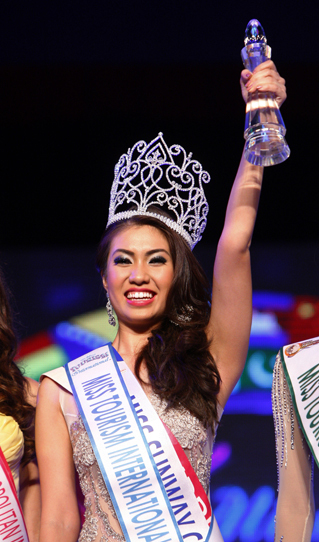 "She captured our hearts when she won the title Mutya ng Pilipinas - Tourism 2012. She made the whole country proud when she won the international crown of Miss Tourism International 2012 in Malaysia. A 25-year-old Cebuana who ruled the global pageantry scene. A great loss... Our deepest sympathy and prayers. Filipinos will always be proud of you. Rizzini Alexis Gomez (Birthdate: August 29, 1990)," posted the Mutya ng Pilipinas pageant on Facebook.